Please, send me more information about ref DMD1378 in Casares or similar properties. 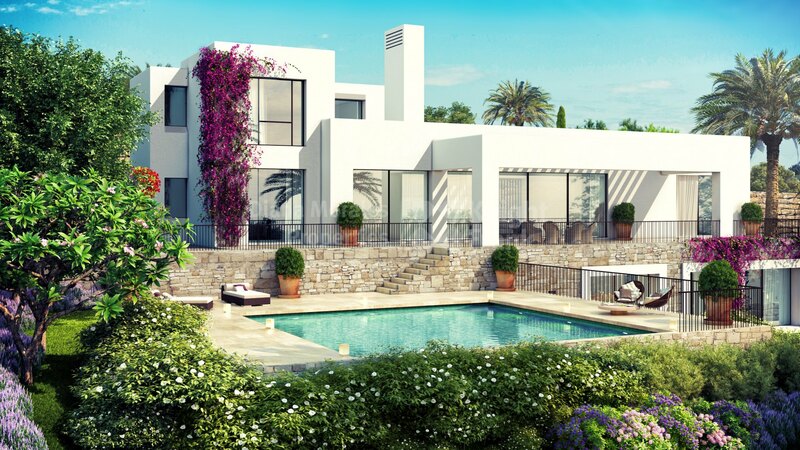 New project of 15 villas situated within a golf course. The residential area comprising the immediate surroundings of a 5-star hotel is concluded and consolidated. 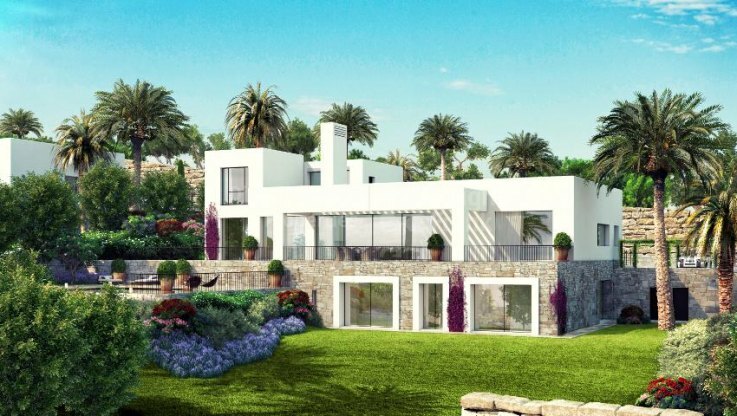 The plot is on a mountainside with enough slope to ensure that all the houses benefit from magnificent views over the golf course and Sierra Bermeja mountain range and some with views also of the sea. 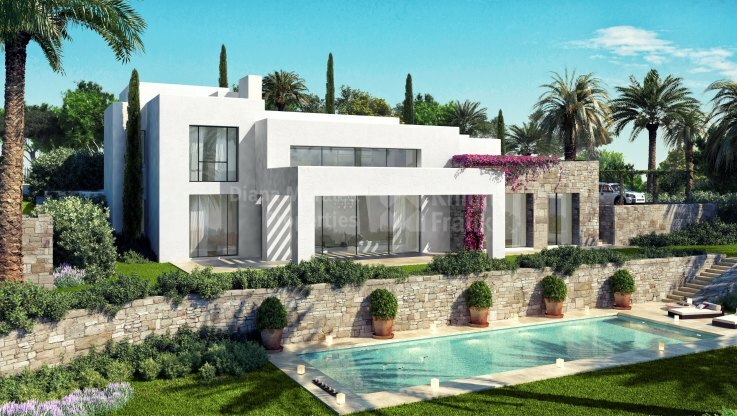 Villas built on individual plots measuring up to 2.200m2. There are three different designs, with 5 and 6 en-suite bedrooms, living rooms measuring up to 90 m2 and 5m high ceiling. Each house will have a private pool and will be equipped with dark lacquered aluminum with thermal bridging insulation on window frames and balconies, with double glazing Climalit glass panels and front door of solid oak wood and glass door with security lock. Roman Travertine plastered and matt polished marble, imported directly from Italy, in the hall, living room, kitchen and bedroom floors. Elegant oak solid wood connecting doors in every room. The spacious wood wardrobes are fully fitted and including chests of drawers, shelves and luggage compartments. Bathrooms floorings and walls are lined with Roman Travertine marble tiles. The same marble is used for the countertops of the recessed basins. The bathrooms, in addition to a bathtub, have a separate shower booth. The fittings are manufactured by Villeroy & Bosch or Duravit. The cast-iron bathtubs are by Kaldewei, model Oval duo. The chrome taps are by Axor or Dombracht. Gaggenau and Miele appliances.The countertop are Silestone. The Gaggenau appliances include: two-door refrigerator; refrigerator and wine cooler; multipurpose stainless steel oven; microwave model, 4 plate touch-control hob with stainless steel frame. The dishwasher is by Miele. The utility room is equipped with a Miele washing machine and a Miele tumble dryer. Domestic hot water is produced by Daikin equipment, Altherma system, with return system in the bathrooms and a 300l tank. Additionally, there are Daikin solar panels on the roof. Daikin air conditioning with individual climate control panels in every room. Hydraulic under floor heating throughout the property, except bathrooms that use a radiation heating system. All the rooms, including the kitchen, have telephone and TV points. Each villa has an alarm system that is connected to the security office. Flood detection systems, fitted in the bathrooms and kitchen. The kitchen is fitted with a smoke detector. GIRA system for climate control, video intercom, technical alarms and different scenarios. Each house has parking for two vehicles. The ample gardens are designed by one of Spain’s top landscape artists and it is a superb combination of trees with native vegetation. Possibility of enjoying the services of the hotel including meals served in your own home, housekeeping, interior design work and general maintenance and gardening. Turn inland off the coastal road just after Estepona and you head through beautiful green valleys and forested hills into the foothills of the Serranía de Ronda, the large mountain range that dominates much of the Andalusian interior.